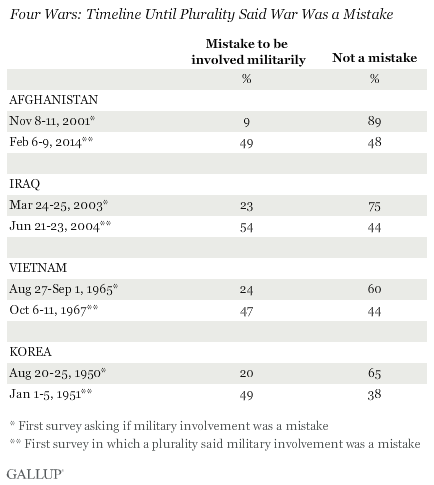 PRINCETON, NJ -February 19, 2014 – Gallup Polls – For the first time since the U.S. initially became involved in Afghanistan in 2001, Americans are as likely to say U.S. military involvement there was a mistake as to say it was not. Gallup first asked Americans about U.S. intervention in Afghanistan in November 2001, just after the U.S. sent armed forces into that country in an effort to retaliate against those who had harbored the al Qaeda terrorists responsible for the 9/11 attacks. At that point, fewer than one in 10 Americans said U.S. involvement there was a mistake — the most positive assessment of any war since Gallup first asked the “mistake” question during the Korean War in 1950. 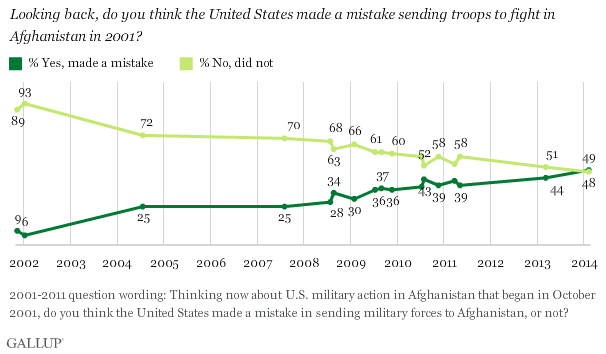 Clearly, in the turbulent atmosphere and general “rally effect” environment that followed 9/11, Americans were overwhelmingly supportive of the decision to send the U.S. military to Afghanistan. Americans’ perceptions that U.S. involvement in Afghanistan was a mistake rose as the war continued, although there were some ups and downs over the years. The “mistake” percentage reached 25% in 2004, and surpassed 30% for the first time in 2008, and 40% in 2010. Now, in Gallup’s Feb. 6-9, 2014, World Affairs survey, conducted some 12 years and four months after action in Afghanistan began, Americans’ views essentially split down the middle, with 49% saying involvement there was a mistake and 48% saying it was not. Although only one in five Americans in the late summer of 1950 initially thought U.S. involvement in Korea was a mistake, less than six months later — after the Chinese Communists had poured over the Yalu River into North Korea, turning the war into a bloody stalemate — attitudes shifted dramatically: 49% said U.S. involvement was a mistake, while 38% said it was not. Republicans and independents who lean Republican are significantly less likely than Democrats and Democratic leaners to say the war in Afghanistan was a mistake. U.S. involvement in Afghanistan began under a Republican president, George W. Bush, but it has continued under Barack Obama, a Democratic president. Therefore, Republicans’ higher levels of support may be related to a Republican president’s initiation of the war, or an ideological inclination to support military involvement. Afghanistan has become America’s longest war, stretching over 12 years since U.S. military forces were first sent in 2001, with well over 35,000 troops still there. Americans were initially more supportive of involvement in Afghanistan than they were for any recent major military intervention. They also maintained a generally supportive posture toward U.S. involvement in Afghanistan for a longer period of time than was the case for other wars. But Americans’ waning patience with the conflict has finally reached the point at which Americans are as likely to say the war was a mistake as to say it was not. The Obama administration plans to draw down the number of troops in Afghanistan significantly by the end of this year. Once that happens, and the war essentially ends, Americans’ assessments of whether intervention was a mistake will largely depend on the political course Afghanistan takes, including whether terrorist cells are able to regroup there. Gallup research conducted in Afghanistan shows that Afghans rate their lives as poorly on several dimensions as residents of any country in the world. These findings may suggest that U.S. involvement in that country was not a success from the Afghan people’s perspective, although it is not clear what Afghans’ attitudes were before the war began.